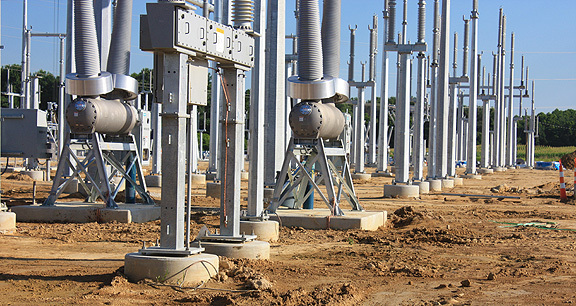 Project obstacles and solutions: AEP was expanding and updating their Fairbanks electrical substation to be a transfer station, routing electricity to three states. The expansion covered a total of 39 acres and required 7,500 yards of concrete for base pads and piers. The challenge of this project involved the safe delivery and pouring of concrete surrounded by such a strong electrical current. In the operational side of the substation, 765,000 volts of electricity are being moved through the lines at any time. Any conducting materials (such as steel) can be charged by being near the substation. This impacted the handling of rebar cages used to reinforce the concrete piers used as a base for the large, high-tension poles. The largest of these piers were 38 feet deep and 72 inches in diameter. It also impacted the concrete mixer trucks delivering concrete to the site. IMI drivers went through training on avoiding injury due to the electrical charge. Each truck had to be grounded with a rod placed in the soil and connecting it to the truck via a jumper cable. Drivers were not allowed to exit the trucks in the "live" zone. They were taught how to safely step out of the trucks once they had driven clear of the active zone. IMI completed this project without any safety incidents. In total, IMI supplied concrete for 250 bases and piers.